Seroyal Oral Health - Homeofresh Toothpaste Chlorophyll Flavor - 2.5. Good dental health is important for many different reasons. For one thing&sbquo; having a healthy smile can make you feel better about yourself. Problems with your teeth and gums can actually lead to serious cardiovascular health problems&sbquo; as well as digestive problems&sbquo; tooth loss&sbquo; and a weakened Immune system. Brushing and flossing your teeth isn&rsquo;t always enough to maintain good dental health&sbquo; especially with the standard brands of toothpaste on the market today. 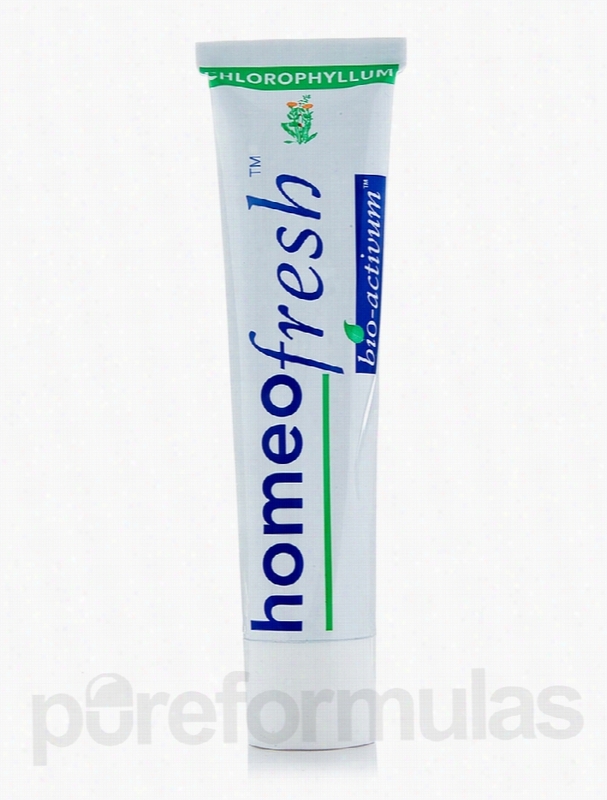 Seroyal&rsquo;s Homeofresh Toothpaste can help protect your teeth and gums. This chlorophyll-flavored toothpaste is made up of 100% natural extracts from fresh plants&sbquo; and also has anti-inflammatory and astringent properties. If you&rsquo;re going for dental checkups and cleanings every six months but are still having problems with your oral health&sbquo; Homeofresh Toothpaste might be right for you. Even if your teeth are perfect&sbquo; its ingredients help you maintain their health and appearance. These ingredients include: Xylitol&sbquo; which is an inhibitor of the bacteria that causes cavities. Xantha gum&sbquo; which is an ingredient used as a thickening agent. Allantoin&sbquo; which is a chemical compound that has been shown to stimulate tissue growth while healing and soothing inflamed gums. One tube of Homeofresh Toothpaste (Chlorophyll Flavor) by Seroyal could last several months&sbquo; depending on how many people use it and how much is used at a time. It&rsquo;s recommended that you place a pea-sized amount on your toothbrush three times a day&sbquo; or however often you brush your teeth. Seroyal is a pharmaceutical company that has been striving to provide patients with the most natural supplements available for almost 30 years. Seroyal prides itself on the reliability&sbquo; quality and&sbquo; consistency of its products. These statements have not been evaluated by the Food and Drug Administration (FDA). These products are not meant to diagnoseÃ¢ÂÂ treat or cure any disease or medical condition. Please consult your doctor before starting any exercise or nutritional supplement program or before using these or any product during pregnancy or if you have a serious medical condition. Biogenesis Nutraceuticals Gastrointestinal/Digestive - Pro Flora Oral. 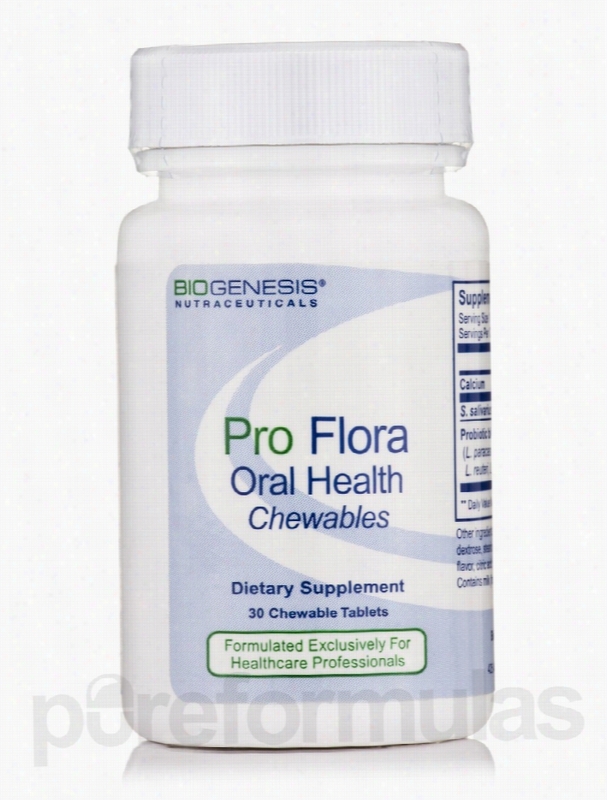 A unique chewable probiotic specifically formulated to support the oral and nasal cavities.Proflora Oral Health is a chewable probiotic specifically formulated with Streptococcus salivarius BLIS K12&reg;&sbquo; a naturally occurring beneficial microorganism that can support dental and upper respiratory health.Provides 3 billion organisms per serving. These statements have not been evaluated by the Food and Drug Administration (FDA). These products are not meant to diagnoseÃ¢ÂÂ treat or cure any disease or medical condition. Please consult your doctor before starting any exercise or Nutritional supplement program or before using these or any product during pregnancy or if you have a serious medical condition. Jason Natural Products Oral Health - Healthy Mouth Tartar Control. 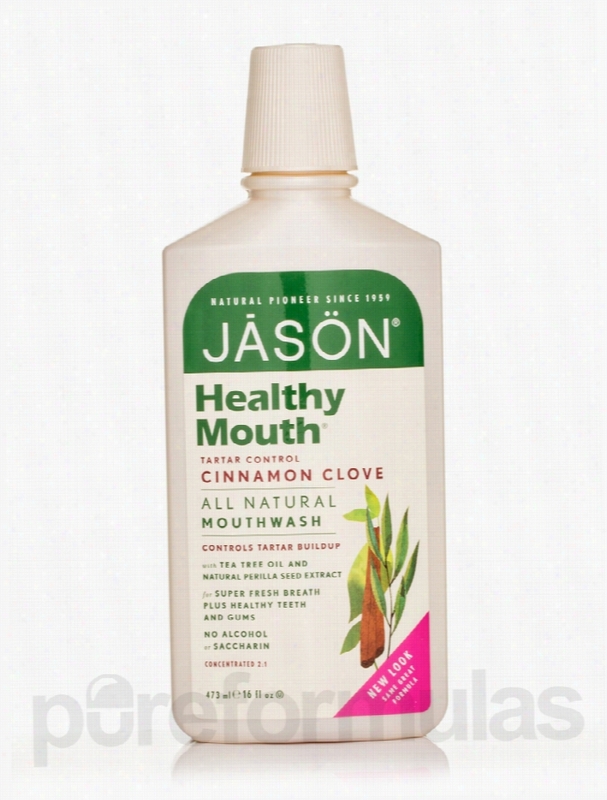 Healthy Mouth Tartar Control Mouthwash Cinnamon Clove 16 fl oz (473 ml) from Jason&reg; Natural Products is a formula that may assist in protecting your oral cavity from tartar forming acids and bacteria. In addition&sbquo; this mouthwash could also soothe your gums&sbquo; disinfect the mouth and leave you with fresh breath. This formula contains tea tree oil that has a pleasant smell. Studies reveal that tree tea oil has the ability to control harmful microbes in the mouth&sbquo; thereby promoting healthy gums and teeth. Many people believe that grapefruit seed extracts may assist in remineralizing the teeth thus making the enamel more resistant to plaque buildup. Perilla seed extracts present in this formula from Jason&reg; Natural Products are rich in polyphenols; it could reduce the formation of tartar and support periodontal health. Aloe vera is rich in nutrients that may have anti-inflammatory properties&sbquo; by which it could promote healthy gums while cinnamon and clove leave your breath smelling fresh. Get Healthy Mouth Tartar Control Mouthwash Cinnamon Clove 16 fl oz (473 ml) from Jason&reg; Natural Products and enjoy stronger gums and improved teeth health. These statements have not been evaluated by the Food and Drug Administration (FDA). These products are not meant to diagnoseÃ¢ÂÂ treat or cure any disease or medical condition. Please consult your doctor before starting any exercise or nutritional supplement program or before using these or any product during pregnancy or if you have a serious medical condition. Jason Natural Products Oral Health - Kid's Orange Toothpaste - 4.2 oz. 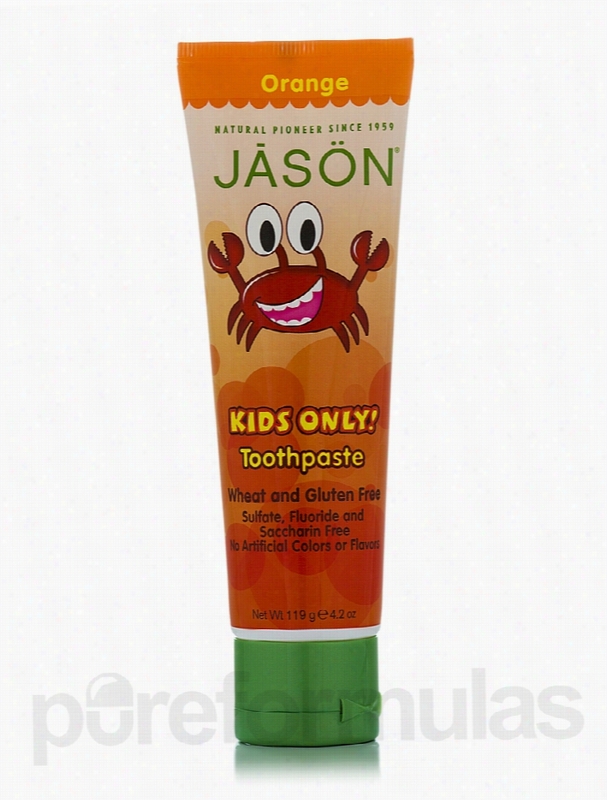 Kid&rsquo;s Orange Toothpaste from Jason&reg; Natural Products is a gluten-free product that may promote strong&sbquo; healthy teeth in your child. This formula contains ingredients that could fortify and soothe your child&rsquo;s teeth and gums. Early and regular care of primary teeth could play a role in promoting healthy and clean teeth in children as they grow up. Calcium carbonate in this supplement from Jason&reg; Natural Products may strengthen teeth and could soothe teething pains as well. Aloe vera extracts could have anti microbial and anti-inflammatory properties that may promote healthy teeth in your children. This fluoride-free toothpaste contains pot marigold extracts that are rich in Flavonoids and carotenoids to potentially improve oral hygiene. In addition&sbquo; the fresh fruity flavor of this toothpaste could entice your kids to brush regularly! Switch to Kid&rsquo;s Orange Toothpaste from Jason&reg; Natural Products and make your child&rsquo;s teeth stronger and healthier. These statements have not been evaluated by the Food and Drug Administration (FDA). These products are not meant to diagnoseÃ¢ÂÂ treat or cure any disease or medical condition. Please consult your doctor before starting any exercise or nutritional supplement program or before using these or any product during pregnancy or if you have a serious medical condition. 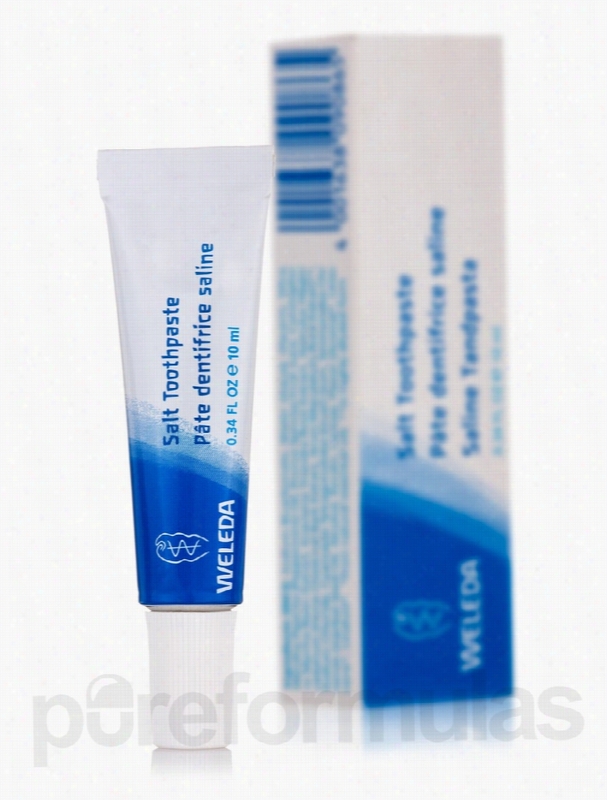 Weleda Oral Health - Salt Toothpaste - 0.34 fl. oz (10 ml). Salt Toothpaste helps to neutralize harmful acids and to prevent the build-up of plaque.Teeth in need of a whitening scrub-down get sensational cleaning with this remarkable toothpaste. It&rsquo;s a full oral cleansing that helps prevent the buildup of plaque and cares for your gums.Developed with the cooperation of European dentists long before baking soda toothpastes became trendy&sbquo; this unique formula includes sea salt to create a powerful natural cleanser and whitener for your teeth. Your gums are purified and stimulated by organic blackthorn flower extract. The gently effective disinfectant in our soothing myrrh extract and the astringent properties of organic ratanhia are proven healthcare secrets from ancient cultures that naturally clean and tone your modern mouth. You&rsquo;re left with brilliant&sbquo; white teeth in a refreshed and healthy mouth. Show off those pure whites from ear to ear &mdash; little says more about you than a naturally beautiful smile. These statements have not been evaluated by the Food and Drug Administration (FDA). These products are not meant to diagnoseÃ¢ÂÂ treat or cure any disease or medical condition. Please consult your doctor before starting any exercise or Nutritional supplement program or before using these or any product during pregnancy or if you have a serious medical condition. 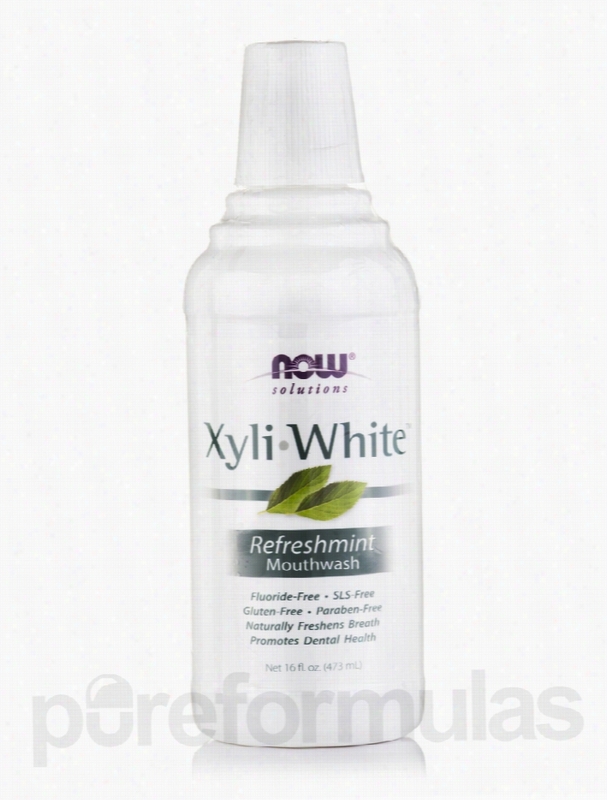 NOW Oral Health - NOW Solutions - XyliWhite Mouthwash,. NOW&reg; Xyliwhite&trade; Mouthwash is an effective fluoride-free oral rinse that works in unique ways to help you achieve a smile that's healthier and brighter than ever before! Xyliwhite&trade; Mouthwash gets its cleansing properties from xylitol a naturally occurring sugar alcohol that has been shown in clinical studies to help promote dental health; effectively rinsing debris&sbquo; such as food particles containing bacteria from mouth surfaces. Xylitol also helps safeguard healthy tooth enamel surfaces. By preventing the mouth's pH levels from falling below their normal range&sbquo; Xyliwhite&trade; Mouthwash protects the enamel surface of teeth.Product Highlights:- Promotes Dental Health. These statements have not been evaluated by the Food and Drug Administration (FDA). These Products are not meant to diagnoseÃ¢ÂÂ treat or cure any disease or medical condition. Please consult your doctor before starting any exercise or nutritional supplement program or before using these or any product during pregnancy or if you have a serious medical condition. Seroyal Oral Health - Homeofresh Toothpaste Citrus Flavor - 2.5 oz (84. Homeofresh Toothpaste (Citrus Flavor) by Seroyal uses Unda&rsquo;s homeopathic principles-such as the use of herbs that are wildcrafted or grown through biodynamic agriculture&sbquo; as well as other pure materials-to create a natural toothpaste that tastes great while promoting Oral health. It contains fresh plant extracts that may be able to soothe your gums without being abrasive on tooth enamel. One of the main ingredients of Homeofresh Toothpaste is allantoin&sbquo; which comes from the root of comfrey&sbquo; a shrub that grows in parts of Europe and Asia. Allantoin may promote tissue growth and improve your comfort level if you have mildly inflamed gums. Meanwhile&sbquo; Seroyal's Homeofresh Toothpaste also contains xylitol&sbquo; a natural sweetener from birch tree bark that may work to inhibit the growth of streptococcus mutans (a form of bacteria that may contribute to cavities). Last but not least&sbquo; the natural citrus flavor gives this natural toothpaste a pleasant lemon taste that suits all ages. Each tube of Seroyal&rsquo;s Citrus Flavor Homeofresh Toothpaste contains two-and-a-half ounces&sbquo; which may work to protect your teeth from mild dental plaque buildup and promote overall periodontal health. These statements have not been evaluated by the Food and Drug Administration (FDA). These products are not meant to diagnoseÃ¢ÂÂ treat or cure any disease or medical condition. Please consult your doctor before starting any exercise or nutritional supplement program or before using these or any product during pregnancy or if you have a serious medical condition. 10 Ml Liquid Medicine Dispenser Oral Syringe. 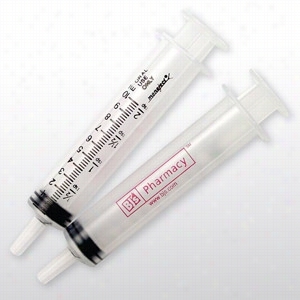 Many easy-to-use dosing sizes with this syringe calibrated in tsp and milliliters. Large syringe offers many dosing options. Complies with FDA. 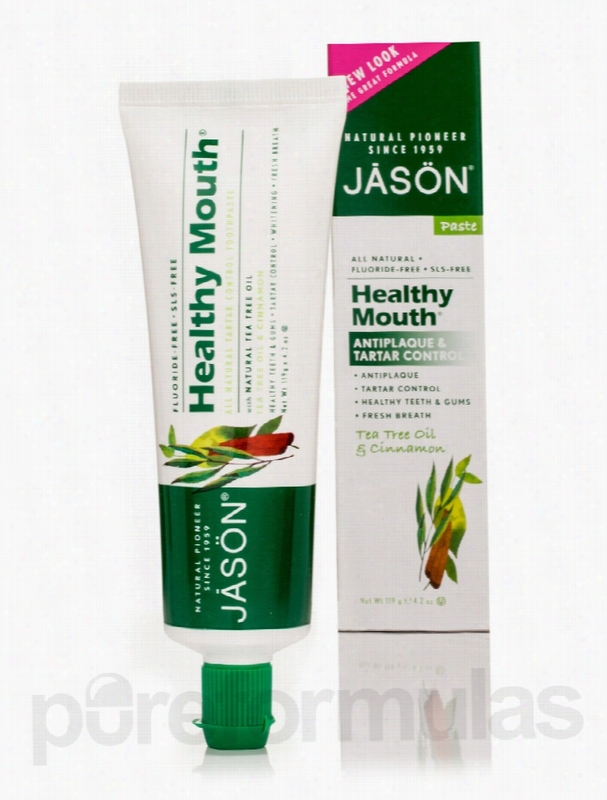 Jason Natural Products Oral Health - Healthy Mouth Tartar Control &. Keep your whole mouth healthy&sbquo; without harsh abrasives or irritating chemicals. 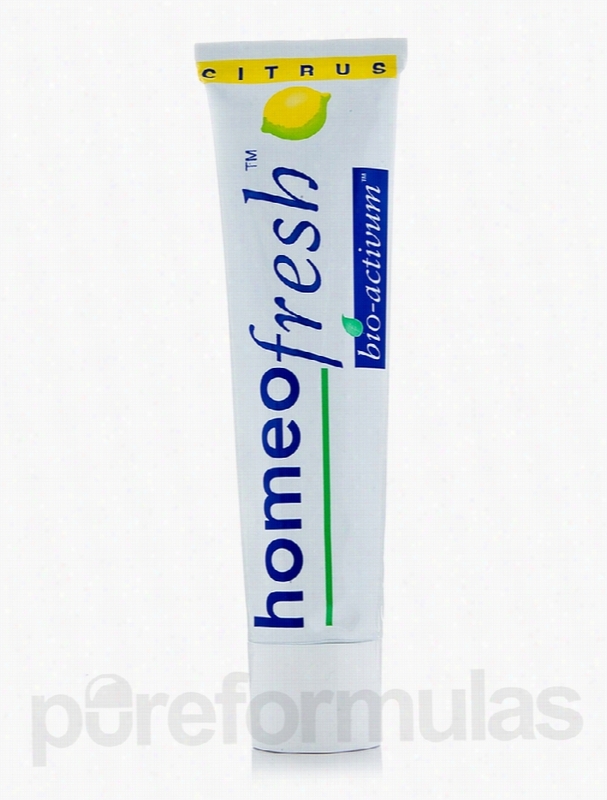 HealthyMouth&reg; All Natural Toothpaste guards your teeth and gums from sugar acids and tooth decay. Tea Tree Oil&sbquo; a well-known antimicrobial and antiseptic agent&sbquo; helps defend the entire oral cavity from the bacterial growth that could lead to periodontal disease. Natural Grapefruit Seed and Perilla Seed Extracts help reduce tartar build-up while Aloe Vera Gel soothes gum irritation. A refreshing Cinnamon chill keeps your breath fresh all day. For a healthy smile and fresh breath&sbquo; use JASON HealthyMouth&reg; toothpaste and mouthwash twice a day. The JAS&Ouml;N natural toothpastes promise:- No Sodium Lauryl/Laureth Sulfates.- No Preservatives.- No Artificial Colors.- No Artificial Sweeteners.- No Saccharin.- No Propylene Glycol.- No Gluten. These statements have not been evaluated by the Food and Drug Administration (FDA). These products are not meant to diagnoseÃ¢ÂÂ treat or cure any disease or medical condition. Please consult your doctor before starting any exercise or nutritional supplement program or before using these or any product during pregnancy or if you have a serious medical condition. 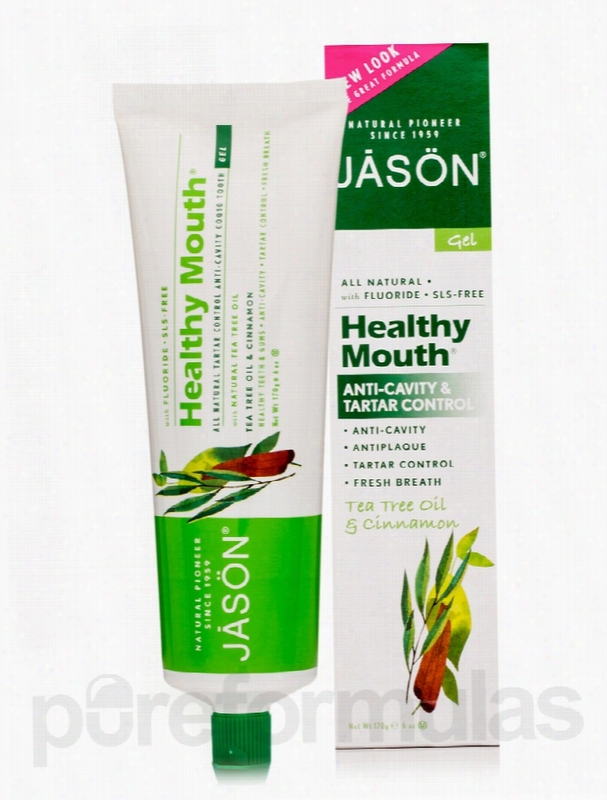 Jason Natural Products Oral Health - Healthy Mouth Anti-Cavity &. Keep your whole mouth healthy&sbquo; without harsh abrasives or irritating chemicals. Healthy Mouth&reg; All Natural CoQ10 Tooth Gel guards your teeth and gums from sugar acids and tooth decay. Tea Tree Oil&sbquo; a well-known antimicrobial and antiseptic agent&sbquo; works with Fluoride to help defend the entire Oral cavity from the bacterial growth that could lead to tartar build-up and periodontal disease. Natural Grapefruit Seed and Perilla Seed Extracts help reduce tartar build-up while CoQ10 and Aloe Vera Gel soothe gum irritation. A refreshing Cinnamon chill keeps your breath fresh all day. For a healthy smile and fresh breath&sbquo; use JASON HealthyMouth&reg; toothpaste and mouthwash twice a day. The JAS&Ouml;N natural toothpastes promise:- No Sodium Lauryl/Laureth Sulfates- No Preservatives- No Artificial Colors- No Artificial Sweeteners- No Saccharin- No Propylene Glycol- No Gluten These statements have not been evaluated by the Food and Drug Administration (FDA). These products are not meant to diagnoseÃ¢ÂÂ treat or cure any disease or medical condition. Please consult your doctor before starting any exercise or nutritional supplement program or before using these or any product during pregnancy or if you have a serious medical condition.